Recently Hanson, the aggregates, concrete and cement producing company, which originally dug gravel from Rickneys Quarry, applied to extend their extraction rights at the quarry until 31st December 2021. Ben Penrose, Chairman of the MRA, has replied to HCC expressing concerns from residents, which has been replicated below. Residents have until 29th January to make their own views known. I am writing to you in my capacity as Chairman of Molewood Residents’ Association. Our residential representation includes roads and properties adjacent to the Bengeo Field and many of our residents use the Public Rights of Way between Bengeo and Chapmore End for recreational purposes. Therefore, we as a committee and subsequently in discussing concerns with other residents in Molewood would like to raise our concerns for consideration in the application 3/2077-13. The application is Hanson’s recent request to extend the permission that they have for quarrying the site at Rickneys until December 2021. 1) Their planning permission had expired in December 2017. To postpone a further application by 12 months shows the general care and focus that Hanson have demonstrated in respect to this site. i.e. they are not providing local residents with due care and respect in matters that can affect their quality of life. 2) In respect to the site, Hanson’s haven’t demonstrated a careful and considerate maintenance of the site whilst it has remained moth-balled. 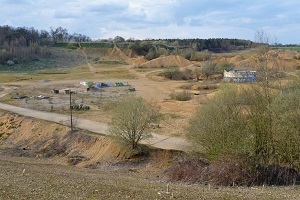 Issues with the land has included Moto-Cross bike riding, anti-social behaviour and contamination of the site where clean up of the site wasn’t under-taken with due care and attention. 3) Rickneys is no longer a defined preferred area for quarrying in the proposed Minerals Plan for Hertfordshire. In this context the extension to planning permission would not match up to the longer-term plans for the minerals requirement from this part of Hertfordshire. We find this point particularly confusing in that Hanson’s didn’t put the site forward for consideration in the plan and allowed the last extension to expire without re-applying it.. There remains a concern amongst residents that granting permission could lead to the starting of quarrying on a site effectively “outside the process”. This would be very damaging for relations between local residents and HCC… a real worry when EHDC recent turn-around on their position in respect to the land at Ware Park have damaged their reputation across Molewood. As a Residents’ Association we ask that Hanson’s request for a further extension to quarrying Rickney’s site is declined and that they are ordered to wind the site up – returning it to a fully restored site by the end of 2021 in line with the recommended Herts Minerals Plan.